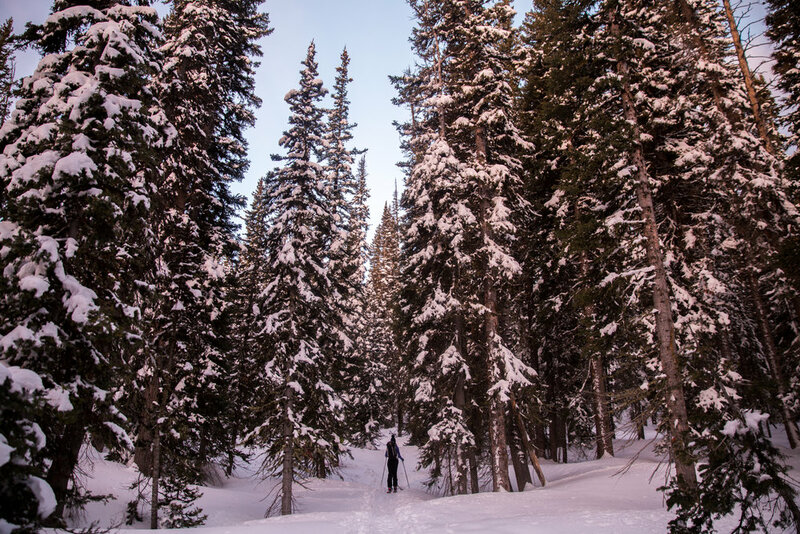 Our Intermountain Marketing Manager Makaela Herran is back at it with another story of chasing winter in the mountains of Colorado. Photos and words by Makaela. All of my adventures have at least one thing in common: They always start around the dinner table; friends, warm toasts, hours of jokes and laughter, all topped off with a delicious amount of ski trip planning for dessert (and maybe some chocolate)! And on a Saturday evening in March, I found just that! I was surrounded by the company of my best friend and her adventurous family in Steamboat, Colorado. Their home in Steamboat has always been a welcoming environment, and second home for me. That night, we prepared a delicious dinner, shared some red wine, and hopped on Google Earth to find something skiable. 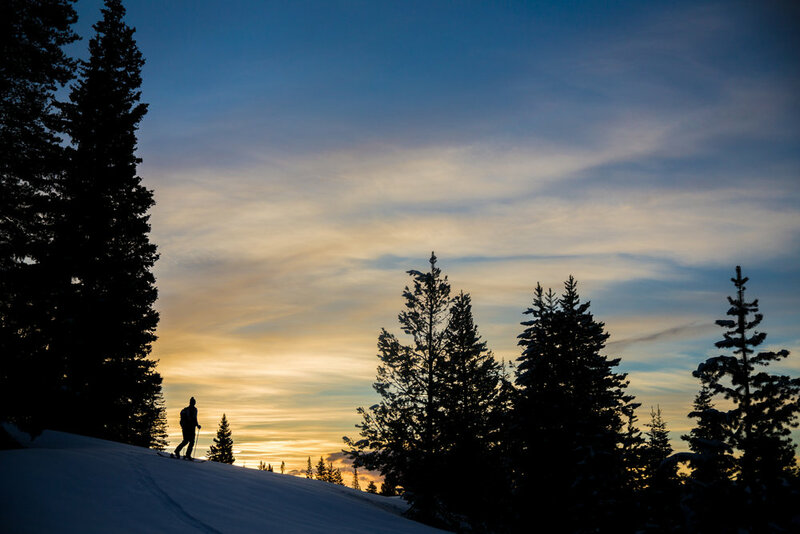 We didn’t have a set plan, but we knew we wanted to catch the sunrise from a nearby peak at Rabbit Ears Pass and set out to ski it at 4:30 the next morning! I’m typically not a morning person, but when a sunset and an adventure are on the line, I’ll get up at any hour. As you can imagine, 4:30 came VERY quickly and the four of us congregated in the kitchen and packed our ski bags, complete with the breakfast burritos we had assembled the night before. We each downed a small cup of coffee and hit the road. It was a short, dark drive to the trailhead of Walden Peak. We blasted music to wake ourselves up fully and get everyone excited for the adventure ahead. 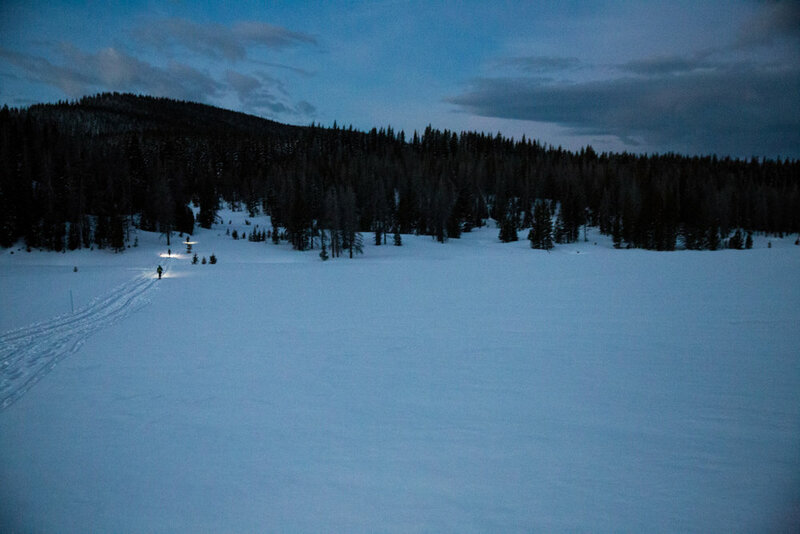 By the light of our headlamps, we started in the direction of Walden Peak, soon meeting up with a groomed nordic ski track that we followed across a small field. The air wasn’t as cold as we had expected, and even though it was still dark out, I found myself working very hard and shedding layers early. Our hike in was only two miles to the peak, which we were hoping to hit for the 7:12 sunrise. If we got there even earlier, we could bask in the alpenglow while we enjoyed our breakfast burritos! Once off the nordic ski track, we met up with a skin track that had been cut the day before. The skiing track twisted through the pines and gradually got steeper, revealing Walden Peak. We were still about half a mile from the peak when the trees around us started glowing pink—the alpenglow! Realizing that we might not make sunrise now, we hiked as quickly as we could. The sun came out over Rabbit Ears Peak and lit our backsides on the final uphill stretch. Absolutely stunning! We were so grateful we actually had a view for the sunrise. When we got the top, we took off our skins and bundled up to keep warm from the chilly wind. We all sat in a line, overlooking the pass and said a toast with an early morning summit beer, and of course, the aforementioned breakfast burritos. After all that work of hiking uphill, the excitement for the skiing was infinite! Since it had snowed eleven inches the morning before and then warmed up to nearly 60, the snow had melted down, creating a hard crust on top. The hard sun-crust took us down one by one as we realized we couldn’t make any turns in it. 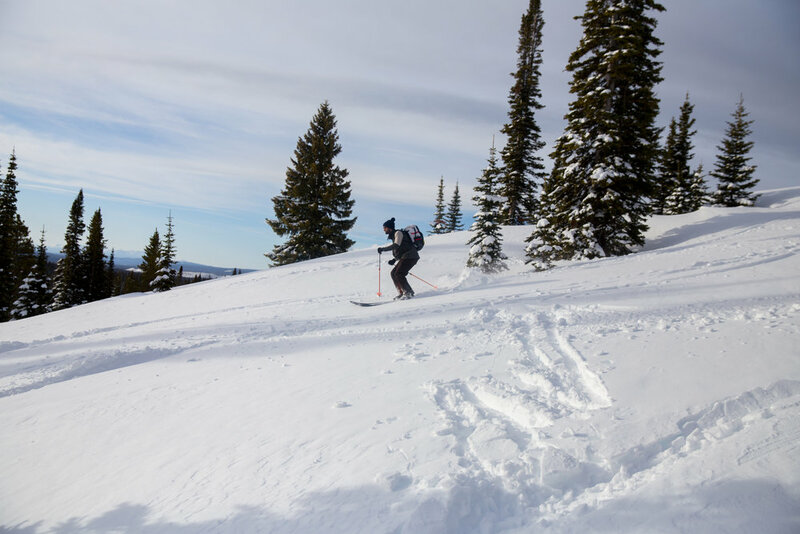 If you’ve ever skied on this kind of snow, you know it’s not easy and isn’t too fun either, or maybe I’m just spoiled by the Greatest Snow on Earth in Utah! Conditions aside, I’ll give Colorado a second chance next winter! Nothing beats the camaraderie of an early-morning adventure with friends, and the view wasn't bad either.